DETROIT — General Motors recognized its most innovative partners at its 26th Supplier of the Year awards ceremony on April 20 in Orlando, Florida. Recipients of the Supplier of the Year award include 125 suppliers from 17 countries, with 16 first-time winners, as well as eleven companies who earned GM’s Innovation Award, Overdrive Award and Customer of the Year award. GM marked the 50th anniversary of its supplier diversity program by recognizing nine suppliers owned by minorities and/or women – eight Supplier of the Year award winners and one Overdrive Award winner. GM’s Supplier of the Year award is reserved for suppliers that distinguish themselves by going above and beyond GM’s requirements, providing customers with the most innovative technologies and highest quality in the automotive industry. Alps Electric, Czarnowski Display Services, Ushr Inc. and Nexteer Automotive won the Innovation Award for delivering cutting-edge technologies that substantially enhance vehicle capabilities and/or customer experience. Alps Electric was recognized for its ultra-short-range radar technology. The advanced system enables autonomous vehicles to precisely sense their immediate surroundings. Czarnowski Display Services, also a Supplier of the Year award winner, won praise for digital fidelity matching technology that uses LED displays to create a kinetic architectural mise-en-scène at auto shows and other events. Ushr was lauded for developing high-definition map technology that enables autonomous vehicles to navigate roads accurately and safely. Nexteer Automotive distinguished itself by developing an autonomous electric power steering system with a fail-safe backup for autonomous maneuvers. Adient PLC, Kawasaki Kisen Kaisha LTD, Linamar and ServiCom received the Overdrive Award for their extraordinary leadership in cultural change and commitment initiatives that drive exceptional business results for GM. GM’s Customer of the Year award was presented to AT&T, CSX and Penske. The 2017 award winners were chosen by a global team of GM purchasing, engineering, quality, manufacturing and logistics executives. Winners were selected based on performance criteria in Product Purchasing, Indirect Purchasing, Logistics, Customer Care and Aftersales. Android Industries ATLASBX CO., LTD.
Autoliv, Inc. Bao Shan Iron & Steel Co., Ltd.
Bose Corporation Brake Parts Inc.
Carl Zeiss Industrial Metrology, LLC CHASYS CO., LTD.
Chunil Engineering Co., Ltd. Cisco Systems, Inc.
Creative Techniques, Inc. CTA Acoustics, Inc.
Czarnowski Display Services, Inc. DAEYONG INDUSTRY CO.
Day & Ross Dedicated Logistics DGENX CO., LTD.
GRAND TRAVERSE PLASTICS CORP. Ground Effects Ltd.
GS TECH CO., LTD. Hankook Tire America Corp.
JPC Automotive Co., Ltd. KAWASAKI KISEN KAISHA, LTD.
KM&I Co., Ltd. KOREA AUTOGLASS CO., LTD.
Lear Corporation Lee Contracting, Inc.
Mobis Co., Ltd. MOREX Co., Ltd.
Nemak NGK Spark Plug Co. Ltd.
Plast-O-Foam LLC PRECISION INTERNATIONAL AUTOMOTIVE PRODUCTS INC.
Robert Bosch Car Multimedia GmbH Ryder System, Inc.
T.V. Minority Co. Inc. Taeyang Metal Industrial Co., Ltd.
Tenneco Clean Air Division Trace Die Cast, Inc.
Windsor Mold Group-Automotive Components Division Wooshin Safety Systems Co., Ltd.
Yazaki YEONG HWA METAL Co., Ltd.
General Motors Co. (NYSE: GM) and its partners produce vehicles in 30 countries, and the company has leadership positions in the world’s largest and fastest-growing automotive markets. GM, its subsidiaries and joint venture entities sell vehicles under the Chevrolet, Cadillac, Baojun, Buick, GMC, Holden, Jiefang and Wuling brands. More information on the company and its subsidiaries, including OnStar, a global leader in vehicle safety, security and information services, can be found at http://www.gm.com. Orlando, Mar 30, 2017 – Chunil Engineering Co., Ltd. was named a GM Supplier of the Year by General Motors during its 25th annual Supplier of the Year awards ceremony held Friday, March 31 in Orlando, Florida. GM recognized 118 of its best suppliers from 15 countries that have consistently exceeded GM’s expectations, created outstanding value or brought new innovations to the company. 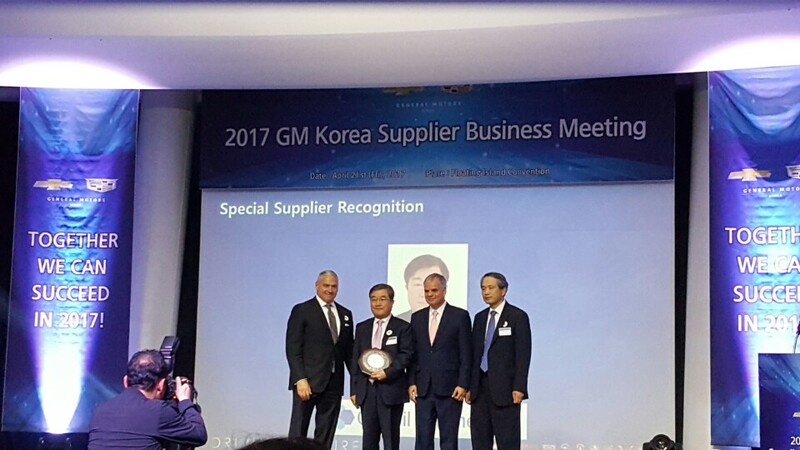 The announcement represented the most suppliers GM has recognized since debuting the Supplier of the Year event in 1992. This is the 5th time Chunil has received the award. DETROIT — General Motors recognized 118 of its best global suppliers during its 25th annual Supplier of the Year awards ceremony on March 31 in Orlando, Florida. GM recognized more suppliers this year than in any year since the first Supplier of the Year event. More than half of the suppliers were repeat winners from 2015, including global filter supplier Mann+Hummel, which received the exclusive Silver Anniversary Award for consistent performance. It has been named a Supplier of the Year 22 times in the program’s 25-year history. ECM (Vehicle Delivery Service) Ltd.
Hua Wei Surface Decoration, Inc.
Mitsubishi Electronic Automotive America, Inc.
Morris Manufacturing and Sales Corp.
YEONG HWA METAL Co., Ltd.
SEOUL, Aug. 18 (Yonhap) — President Park Geun-hye on Thursday visited a vocational school and a company in the western port city of Incheon to promote a dual education system, a key element of a broader program to address youth unemployment and nurture young talent. The system combines apprenticeships in a company and education at a vocational school. Under it, students take classes at their school for three days a week and receive the standard quantity of training at a designated company for two days. The chief executive met with students at the Incheon Mechanical Technical High School and those being trained at Chunil Engineering Co. to offer her encouragement and evaluate whether the dual system has been running properly. It is the latest in a recent series of her on-site tours aimed at promoting government policies to enhance the well-being of citizens. A large number of students at college- or university-level institutions have also been participating in the system, which the government has been pushing to introduce to South Korea since September 2013. The system has been crafted based on a set of models that Germany and Switzerland have been successfully practicing, Seoul officials said. Currently, some 7,700 local companies run apprenticeship programs under the dual system, which some 21,000 students have joined.